Who is the Messiah? Some Jewish people say we are waiting for him to come and we will find out then. Other Jewish people have given up hope for the Messiah. But, we can know beyond a doubt who He is. The prophets of Israel tell us his identifying characteristics. 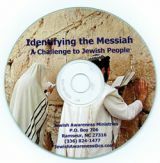 This cd will challenge every Jewish person who listens to it to reconsider who is the Messiah.